Blaxland, Gregory. Alexander's Generals (the Italian Campaign 1944-1945). London: William Kimber. 1979. ISBN 0 7183 0386 5. Bohmler, Rudolf. Monte Cassino: a German View. Cassell. 1964. ASIN B000MMKAYM. Carver, Field Marshall Lord. The Imperial War Museum Book of the War in Italy 1943-1945. London: Sidgwick & Jackson. 2001. ISBN 0 330 48230 0. Clark, Mark. Calculated Risk. New York: Enigma Books. 2007 . ISBN 978-1929631599. Moraes, Mascarenhas. The Brazilian Expeditionary Force By Its Commander. US Government Printing Office. 1966. ASIN: B000PIBXCG. R.Brooks, Thomas. The War North of Rome (June 1944-May 1945). Da Capo Press. 2003. ISBN 978-0306812569. Orgill, Douglas. 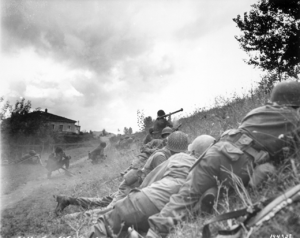 The Gothic Line (The Autumn Campaign in Italy 1944). London: Heinemann. 1967. D'Este, Carlo. World War II in the Mediterranean (1942-1945 Major Battles and Campaigns). Algonquin Books. 1990. ISBN 978-0945575047. Keegan, John. The Second World War. Penguin. 2005. ISBN 978-0143035732. Canadians in Italy, 1943-1945 Lots of media and photos and info on Canadians in the Italian theatre. WW2 propaganda leaflets - use in Italy: A website about airdropped, shelled or rocket fired propaganda leaflets. Italian campaign. Liberatori: A website on the Po river breakout and the liberation of the small town of Cornuda. （意大利文）La Città Invisibile Collection of signs, stories and memories during the Gothic Line age. （意大利文）Italian Partisan Collection of stories and memories from Italian partisan.